Feb. 11, 2016, 11:56 a.m.
By Joseph Lichterman @ylichterman Feb. 11, 2016, 11:56 a.m. The app, released today and only available on iPhone and Apple Watch for now, presents teases to stories in the form of chat bubbles, and then lets users select whether they want to get more information about a topic or move onto the next story. When you choose to go more in depth about a particular story, you’ll get two or three more chat bubbles — sometimes with gifs and charts, too — that let you click to the original story that ran on Quartz or elsewhere on the web. When users have read all the most recent stories, the app will offer quizzes for users to take. 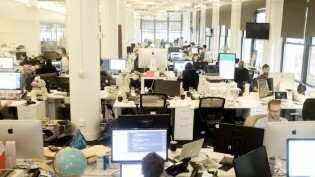 Quartz launched in 2012 as a mobile-focused site, but at the time it didn’t want to build an app in order to make its stories as easily accessible as possible. “We did not want to create any barrier to either discovering or sharing our content,” Quartz publisher Jay Lauf told me last month. But as the site has grown and specific features such as messaging and notifications have become more powerful and popular in other apps, Quartz decided it wanted to see how it could build out those features in one of its own. The new @QZ app takes @nicknotned's original insight – that news should feel like a convo w/ a smart friend- to its most literal point yet. Apple has added more nuance to the kinds of alerts apps can send, so as a result, the Quartz app will only make your phone buzz when it sends major breaking news alerts. Other push notifications — updates when new stories are added to the app, or a haiku that’s sent when the markets close — just light up your phone. Users can decide how many or few notifications they want to receive, and they’re written conversationally, much in the style of BuzzFeed’s news app, which was released last year. That tone fits in with the messaging app feel to Quartz’s app. Throughout the development process, Quartz looked at research on how people interact with text as well as non-news apps, such as the nutrition app Lark and the game Lifeline, which also have conversation-based interfaces, Seward explained in a post introducing the app. The ads in the app are also presented as messages. Chat apps are enormously popular — especially outside the United States — and news organizations have been experimenting with different ways to reach readers there. The BBC is publishing on several different messaging platforms, The New York Times recently began publishing in English and Chinese on WeChat, and Germany’s Bild published soccer news on Facebook Messenger. All the content in Quartz’s app is written by staffers, but the users’ interactions as they choose to progress their way through the app are controlled by bots, and Seward said the site is looking at ways to integrate more bots into the app and elsewhere. To the extent there has been a common critique of the messaging interface in the hours since launch, it’s been that Quartz borrowed one element of chat too literally — the time spent waiting for messages to appear. The @qz interactive fiction news app is adorable but the skeumorphic "the app is typing" pause makes reading it unbearably slow. Last spring, Seward compared Quartz to an API, explaining in a memo that “we don’t mean publish once and send it everywhere. We mean Quartz can go anywhere our readers are, in whatever form is appropriate.” To that end, Quartz is looking at ways to potentially expand this kind of news presentation on its own future apps or elsewhere on other platforms. Best thing about @qz new iPhone app: a baby step into a coming future where news is a conversation. Think Amazon Echo meets "Her." New app from @qz is really fun & more creative than anything anyone else is trying in mobile news. Will it work? Who knows. But it's cool. POSTED Feb. 11, 2016, 11:56 a.m.
Lichterman, Joseph. 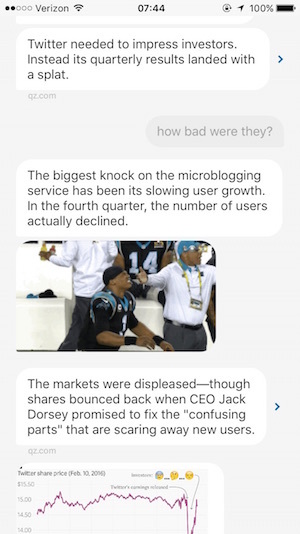 "With an interface that looks like a chat platform, Quartz wants to text you the news in its new app." Nieman Journalism Lab. 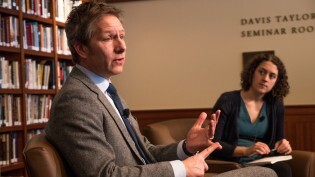 Nieman Foundation for Journalism at Harvard, 11 Feb. 2016. Web. 19 Apr. 2019. Lichterman, Joseph. "With an interface that looks like a chat platform, Quartz wants to text you the news in its new app." Nieman Journalism Lab. Last modified February 11, 2016. 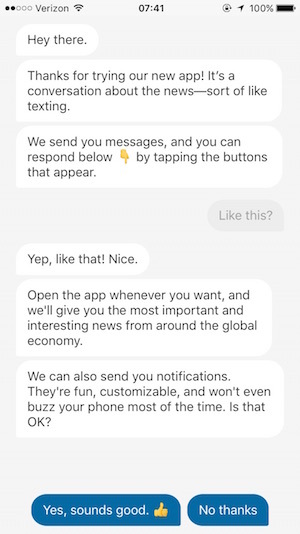 Accessed April 19, 2019. https://www.niemanlab.org/2016/02/with-an-interface-that-looks-like-a-chat-platform-quartz-wants-to-text-you-the-news-in-its-new-app/.